I have never used pomegranate very much in my diet, much less my cooking. I like the flavor, but just have never had the occasion to use it. That changed this weekend when I decided to smoke a pork tenderloin and was looking for a fall flavor profile to go with it. In a clean jar with a tight-fitting lid, combine pomegranate juice, orange juice, mustard, honey, garlic, orange zest, and cayenne pepper. Tighten lid, and shake until everything is mixed well. Pour over pork tenderloin in a large resealable plastic bag. Seal bag, and refrigerate for at least one hour and up to 3 hours. Preheat smoker to 225 degrees F. Remove tenderloin from marinade, reserving the marinade. Place meat on a smoking rack. Pour marinade into a small saucepan. Bring to a boil, reduce heat to simmer, and reduce volume by half. Remove from heat. Place 1/2 of liquid in a cup for basting, and reserve to use as a sauce. Smoke tenderloin for 120 minutes, basting lightly with reduced marinade until internal temperature is 145 degrees F when measured in the thickest part of the tenderloin. Remove tenderloin from smoker, cover with foil, and let rest for 5 to 10 minutes before slicing. Serve each portion with reserved sauce drizzled over top, and a sprinkle of pomegranate seeds. I used cherry smoke in my Bradley and was very, very pleased with how the dish turned out. The pork was perfectly flavored and at only 250 calories for 4 ounces, it is a nice lean meal to enjoy. I used the leftover pork later in the week for sliced pork sandwiches. The beauty of the growing foodie blogger scene is that there are more and better resources when it comes to raising your game while cooking wild game. 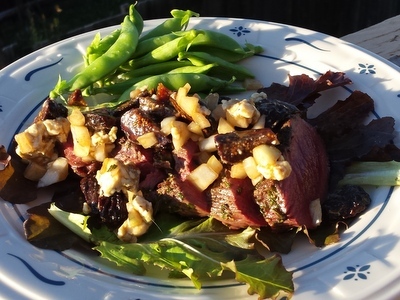 Venison is a lean, flavorful meat that screams to receive a better treatment than frying it in butter and garlic. A few weeks ago I opened my email to see the latest post from Laura’s Wild Kitchen, a Rosemary Steak with Fig and Gorgonzola. Just the title of it made my mouth water, and I decided I needed to give it a try. Last night I pulled out a 12 ounce chunk of venison back strap and decided to put my own spin on the recipe due to circumstances and opportunities. The recipe called for fresh figs, but the King Soopers in Cheyenne didn’t have any, so I went dried. It is also grilling season in Cheyenne, and about 85 degrees outside, so roasting the cut of meat in the oven wasn’t an option. Here is my version of Laura’s recipe. Let the backstrap come to room temp while you prep everything else. (You can just let it sit out as you chop and prep everything.) Preheat the grill to 450. Combine the figs, onion, cheese, balsamic vinegar and 1/2 T of olive oil and toss to combine. Set aside. Use a blender or food processor to blend the rosemary until it is finely chopped. Add the remaining 1/2 Tablespoon of olive oil to a small bowl and combine with the rosemary. Stir until it forms a bit of a paste. Salt and pepper the backstrap to taste and then cover with the oil and rosemary. Grill over direct high heat for two minutes on each side. Remove and grill over indirect heat for an additional 3 minutes for rare, 4 minutes for medium rare. If you are cooking it medium or worse, don’t use this recipe, you will ruin it. Remove from the grill and let rest for 5 minutes. Slice the backstrap into 1/2 inch medallions, plate them and then top with the fig and cheese mixture. This dish would pair well with an Old Vine Zin or a nice brown ale. The earthy flavors of the cheese and fig pair super well with the venison. There is little doubt in my mind that this is the best venison dish that I’ve ever made. It was nice to use fresh rosemary from the garden and venison I put in my freezer myself. We will definitely use this recipe again in the future. 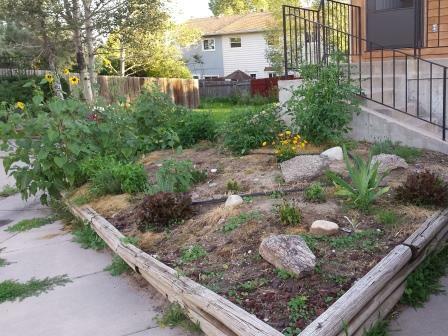 Our townhome in Cheyenne has a front flower garden raised planter that for the first two years we were here was basically a fallow weed bed. We tried to plant some flowers there in the past and aside from some volunteer sunflowers it never really grew anything. It frankly looked awful. This spring, with full knowledge that gardening in Wyoming is a fool’s errand I decided to put a mixture of plants in the ground, in the hopes that we would actually grow some food. When I lived in NY I had amazing raised bed gardens that grew an unbelievable amount of food. I didn’t want to get that deep into it again, but I figured a few things were worth a try. Right now the garden is rounding in to fantastic shape. I have an unbelievable amount of basil, rosemary, thyme, sage, chives and oregano. The lettuce is growing very well even in the hot, hot midday sun we get in Cheyenne. The zucchini seeds were duds and never germinated, but the winter squash is starting to set fruit as we speak. With an abundance of herbs, I needed to get ahead of them and use some for dinner last night. I picked a bunch of basil and made some pesto. 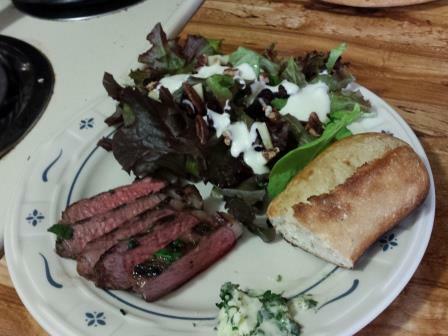 I also picked a variety of herbs and made herbed butter which I used on top of a grilled NY Strip. The butter and herbs enhanced the steak in a way only summer can. 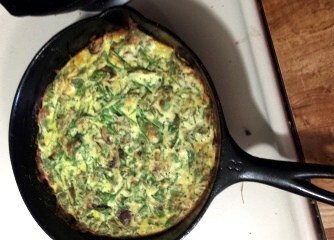 This morning I had a bunch of left over herbs and I threw together a fritatta. I over did it on the herbs and I expected them to wilt and cook down like the spinach did. The flavor was good, but it was a little bit leafy. So it goes when experimenting bu just throwing the herbs in. The recipe also called for four eggs, and I’d probably bump that up to 6, especially since it produces 6 servings. I’d also cut back on the amount of fresh herbs I used. After a couple of years away from gardening, it feels good to be back at it again, and this garden is the perfect size to be working with. I just now have to figure out how to effectively kill the bugs that tend to like to destroy it. Sunday this week was a day of quiet all to myself as Lorrell and Loriana had a girl’s day at the American Girl Store in Denver. 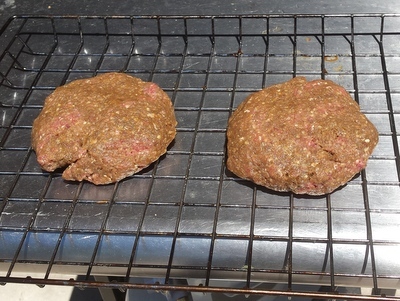 I took that opportunity to throw some venison burgers in the smoker and kick back and enjoy the day. I was already going to smoke some Mac and Cheese, so why not? This was my first attempt at smoking a burger so I did a bit of research on it. The result…. 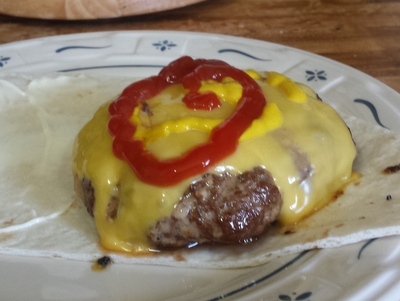 Serve on a bun or in a tortilla with your favorite burger toppings. This is a very simple way to add some smoke flavor and help keep your favorite wild game burger moist. The smoke flavor really stood out despite only being in the smoker for 30 minutes. It definitely adds to the wild game and is well worth the extra time and effort.